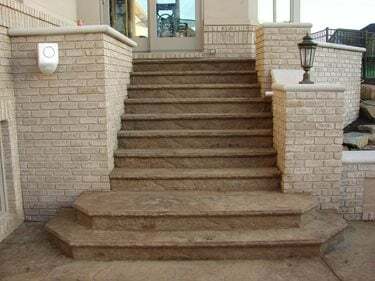 Concrete steps or terraced stairways are the most prominent feature at the entryway of many homes and public buildings, yet too often they get relegated to purely utilitarian status. Elevating concrete stairs from bland to grand makes them the dramatic focal point of any entrance. Even greater visual impact is possible by combining decorative stairways with stamped or stained concrete walkways and landings that incorporate coordinating colors and patterns. 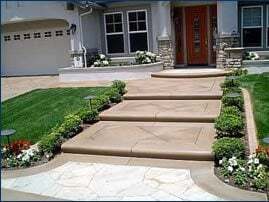 Concrete steps can be poured right along with your walkways or entryway, so they can be colored and textured to match. 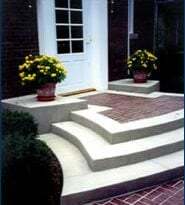 Precast concrete steps and precast concrete stairs are also an option. If you know just where they are needed, you can have the steps built off-site and installed later on your project. Once you work with a contractor to come up with a functional concrete stair design, you can begin narrowing down your decorative options. Here are some ideas for creating concrete stairways that are a step above the ordinary. For more inspiration, browse through our photo gallery or ask contractors to show you portfolios of their past projects. 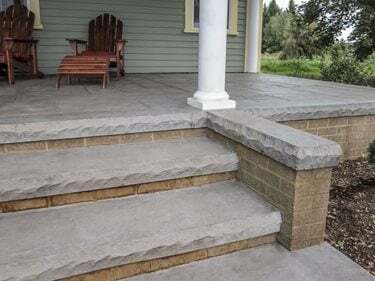 The same methods used for coloring exterior concrete flatwork are equally suitable for stairways. The most popular include adding integral color, staining, and applying dry-shake color hardener. Some contractors combine these techniques to produce unique color variations and marbling effects. 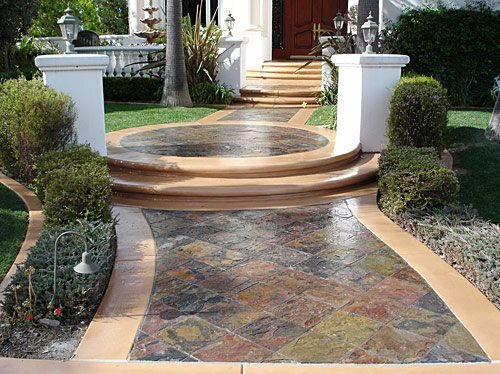 Color hardener and integral color are the methods most commonly used with stamped concrete, with each offering advantages and disadvantages. Stairways are often easier to color integrally because of their vertical step faces. But if you want the richness of color and added durability provided by a dry shake, it is possible to apply the hardener to stair risers if it's mixed into a paste first, says Chris Sullivan, Vice President of Sales and Marketing for ChemSystems Inc. He advises contractors to mix the color hardener with water and a concrete bonding agent to achieve a consistency similar to cake icing and then apply the paste with a small trowel or float before stamping. Photo courtesy of Butterfield Color. Photo courtesy of Concrete Art. The faces of these concrete step treads look like chiseled stone. Curved step noses enhance the architectural flair of this elegant pattern-stamped stairway. There are literally hundreds of stamp patterns to choose from, ranging from slate, to brick, to cobblestone, to botanical and wildlife themes. Because today's stamping mats are often molded from the actual materials they mimic, they produce amazingly realistic results. By extending the pattern from sidewalk to stairway to landing, the overall effect is even more impressive. Contractors can make a seamless transition from flat surfaces to steps by using thin flex mats or texture skins in the same pattern as the rigid mats used for stamping the concrete flatwork. Made from a pliable urethane, these mats are easily bent to a 90-degree angle to conform to stair risers. Another handy way to imprint granite, slate, and other stone-like textures on narrow step treads and vertical faces is to use small texture rollers, such as these from Butterfield Color. With an exposed-aggregate finish, you can produce spectacular effects at a reasonable cost. Many types and sizes of decorative aggregate are available to achieve unlimited color and texture variations. Exposed aggregate also contrasts beautifully with plain concrete or other decorative treatments such as stamping, staining, and integral coloring. On exterior stairways, an exposed-aggregate finish offers the additional benefits of being nonskid and resistant to heavy foot traffic and weather extremes. 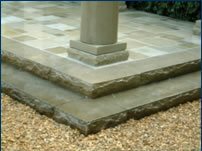 Specially molded polyurethane form liners make it easy to cast concrete steps that resemble slabs of quarried stone. Photo courtesy of Brickform. Textured liners designed specifically for use with step forms make it possible to mold rustic cut-stone profiles in step faces. Step-Liners produce amazing depth of relief of up to 1 1/2 inches. They are made from a reusable polyurethane material and are simply attached to the inside of the riser form before the concrete is poured. Rather than going with a sharp 90-degree step edge, you can create a variety of curved architectural profiles by using step liners made of polystyrene foam. Suppliers include Proline Concrete Tools, Brickform and Butterfield Color. These foam forms adhere to the inside of the formwork and can accommodate various step heights. They also can be bent to conform to curvilinear steps. 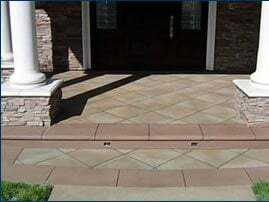 Many decorative sidewalk projects will require steps to transition from one elevation to another, especially at entryways. To achieve a cohesive visual effect with greater dramatic impact, consider combining decorative concrete walkways with stamped or stained stairways and landings that incorporate coordinating colors and patterns. 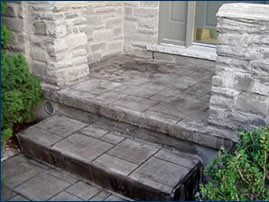 Stairs and walkways share many of the same basic concrete requirements and safety considerations. Plus, the same methods used for coloring exterior concrete flatwork are equally suitable for stairways. The most popular include adding integral color, staining and applying dry-shake color hardener. Some contractors combine these techniques to produce unique color variations and marbling effects. When planning the look of your concrete stairway, don't sacrifice functionality for flair. The most important dimensions are the riser height and tread depth. They should be in proportions that will comfortably accommodate the average person's stride. Although the ratio can vary depending on the application, local building codes often dictate the minimum and maximum riser heights and minimum tread depth. The 7-11 rule is one that's frequently used (maximum riser height of 7 inches and minimum tread depth of 11 inches). Risers should also be at least 4 inches in height. J&H Concrete in Uniontown, OH For safer stepping, design stairways with deep treads and short risers and locate landings no more than 7 1/2 inches below door thresholds.Photo courtesy of Elite Crete. 4" to 4-1/2" 18" to 19"
5" to 5-1/2" 16" to 17"
6" to 6-1/2" 14" to 15"
7" to 7-1/2" 10" to 11"
To prevent tripping, make sure all risers and treads are uniform throughout a flight. A Design Guide for Home Safety, published by the U.S. Department of Housing and Urban Development, recommends keeping variations in riser height and tread width in a flight of stairs to less than 3/16 inch. Using round nosings and enhancing stairs visually with contrasting colors or patterns to make edges more distinct will also help to prevent missteps. Treads narrower than 9 inches in width result in the greatest number of tripping accidents, according to research done at Cornell University. The research also indicates that tread widths of 10 to 13 inches and riser heights of 6 to 8 inches are the most foot-friendly. Light fixtures inset into this step face help prevent dangerous stumbles after dark. Make sure stairs are well lit at night by using overhead lighting and keep light levels consistent in transitions between stairways and surrounding areas. Absence of handrails accounts for a large percentage of falls on stairways, according to Cornell. Rails for stairs should be continuous and installed at a height that accommodates most users. National and state building codes stipulate heights ranging from 34 to 38 inches. Add texture to the concrete treads to make them slip resistant. This can be done by using a textured finish, such as exposed aggregate, or by adding an anti-slip grit to the protective sealer coat. Use the slab calculator to figure the concrete needed for the porch surface. Use the footing calculator to calculate the sides of the porch and the steps. This porch has 9 sq. feet of porch surface, so enter in the slab calculator 4" thickness by 3' width by 3' length. This totals .11 cubic yards. The porch also has 9 linear feet of 6" step. So enter in the footing calculator, 6" depth by 12" width (always figure steps with a 12" width) by 9' length. This totals .17 cubic yards. Repeat this for added layers of steps. Use this handy concrete calculator to help you do the math. Restored Concrete Stairway Project submitted by Dan Mattingly, Mattingly Concrete Inc., Indianapolis, Ind. Incredible Floating Stairs Check out these cool gravity defying steps. Cantilevered Concrete Stairs Learn how designer Fu-Tung Cheng made 300-pound steps magically “float on air”.